David Beckham is back in London - possibly for good - so no wonder his famous pals took him out for a night on the town. 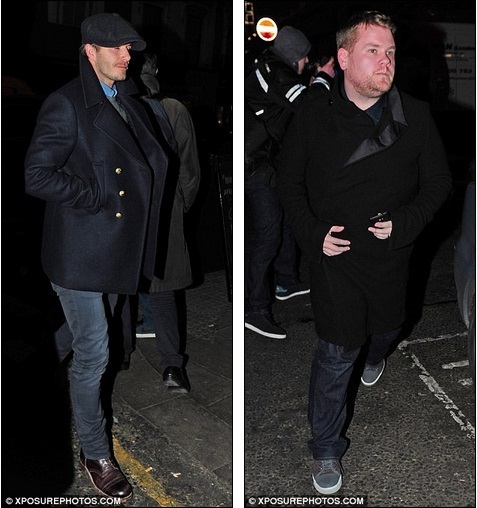 The football star was spotted leaving Little House club in Mayfair on Thursday night, closely followed by celebrity friends James Corden, Freddie Flintoff, Jack Whitehall, Dave Gardner and Jason Statham - who took model girlfriend Rosie Huntington-Whiteley with him. 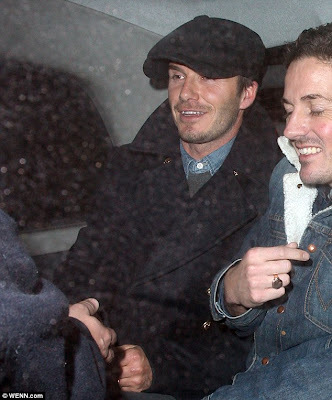 But, as a father of four and with the prospects of getting up early the next day to take care of his brood, David still looked pretty fresh-faced after his night out with the lads. 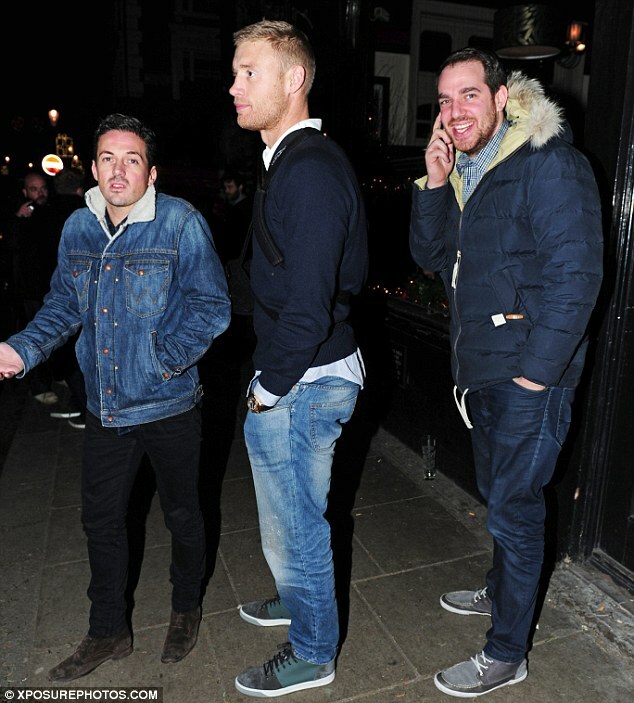 David looked every inch the heartthrob as he casually emerged from the bar and headed over a taxi with his famous friends in tow. 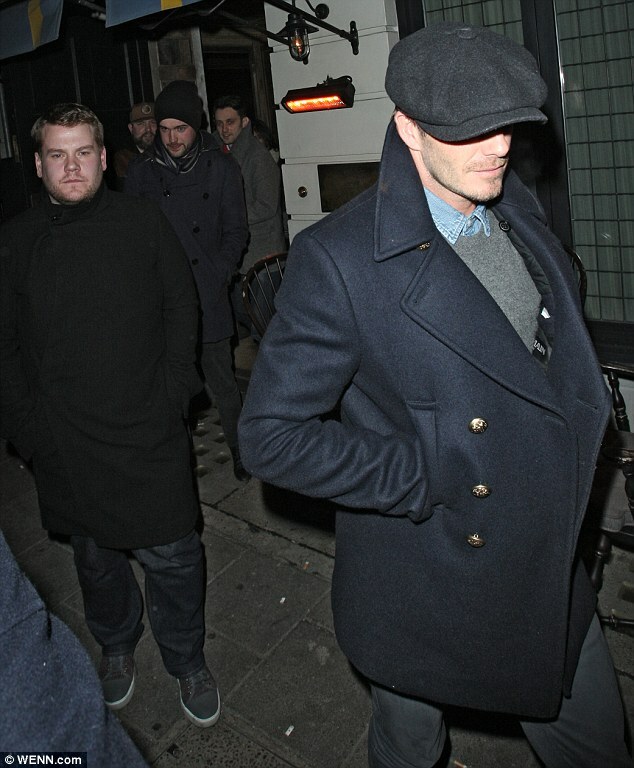 Donning a Baker Boy cap and navy peacoat, the 37-year-old showed off a little hint of his hipster style with a denim shirt that poked out from underneath his grey jumper. 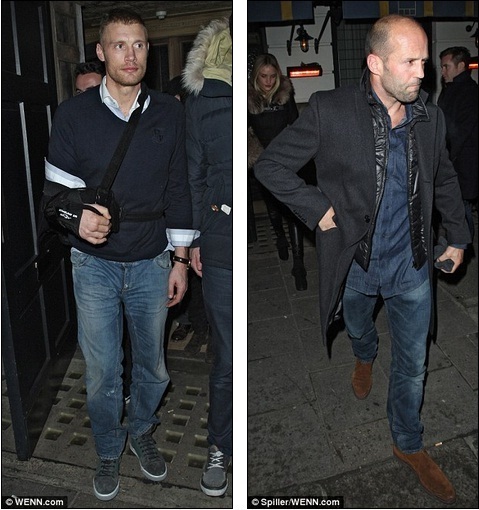 Newly crowned King of British comedy Jack Whitehall kept warm in a woolly hat while cricketer turned boxer Freddie Flintoff, sported an unusual accessory, an arm brace, no doubt earned during his recent fight debut. They were joined by funnyman James Corden who wrapped up warm in a long black coat with satin trim, as David's best friend, football manager Dave Gardner, joined the lads in the awaiting taxi. Jason Statham also attended, but couldn't bear to leave Burberry model girlfriend Rosie home alone, so she provided the glamour on the boys night out. 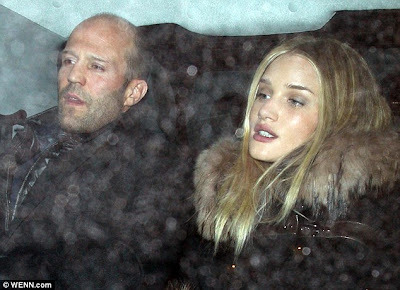 Rosie, 25, stole the show in a duffle style coat with trimmed with fur on the collar and sleeves, and her favourite leather trousers. The action movie star protectively lead his girlfriend by the hand to an awaiting taxi as he presumably followed his other famous friends to the next stop on their night out. David's contract with LA Galaxy has run out and he is believed to be returning to Europe to play for at least two seasons, but the family's plans are yet to be announced. Rumours say the Beckhams are looking to settle back into London, and is has been reported that Victoria already viewed a townhouse in the salubrious Ham Common area and is believed to be in the process of making an offer. The 38-year-old fashion designer was also spotted having a tour of the nearby Harrodian School with her sons. The exclusive £6,000 a term school is best known for its famous alumni including Robert Pattinson, Tom Sturridge and Caggie Dunlop, so the Beckham boys certainly wouldn't feel out of place. The famous couple might be swayed by the calibre of neighbours she would have in the upmarket area, which includes MP Zac Goldsmith and The Who guitarist Pete Townshend.